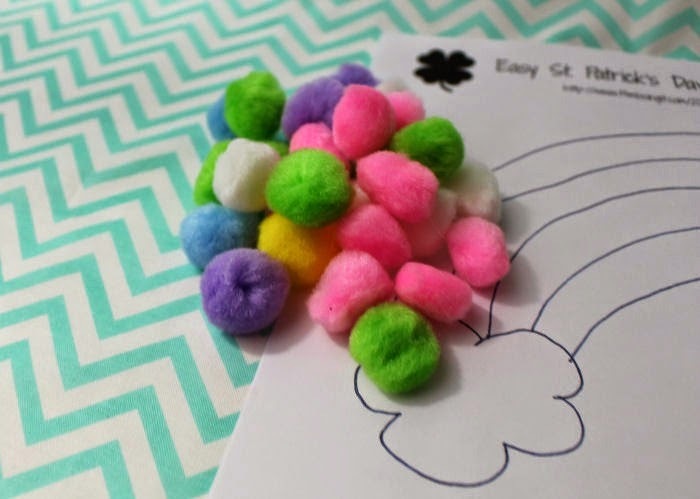 I love to celebrate any holiday by creating a fun craft that my toddler can do. 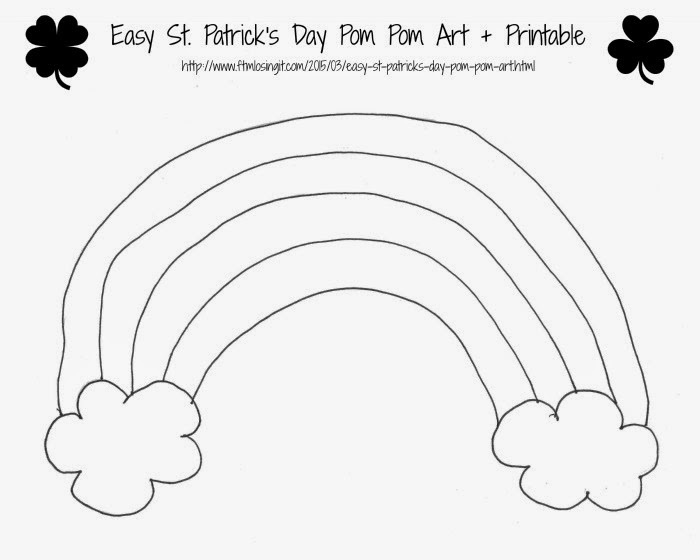 To go with the theme of St. Patrick's Day I created the printable by drawing a rainbow with clouds. Not only does it go with the theme but it is also teaching her colors and patterns. She loved putting stickers on a rainbow when we learned pointillism so I decided to let her have some fun with sticking on some pom poms to the rainbow. First I mixed up all of the pom poms and let her separate them by color. She has known the colors for a long time now so this task was easy for her. I always reinforce what she learns so I asked her a ton of questions about the colors while she separated them. Since it was the first time I was allowing her to dab on her own glue, I put a little bit into an old juice cap and showed her how to dip the tip of the pom pom to paste it onto the printable. I started her off by putting the first color of each rainbow slice and then let her independently figure out where the next ones went. She is at an age right now that she wants to do everything on her own so she felt like a big girl when I got up from the table and cleaned up some dishes while she worked. Then I came back and we had fun playing around with the white pom poms while I showed her where on the printable they went. *To print the printable: Download it onto the desktop or a place you can easily find it. Open up the .PDF -->File --> Print and choose the "Fit" setting. Print. 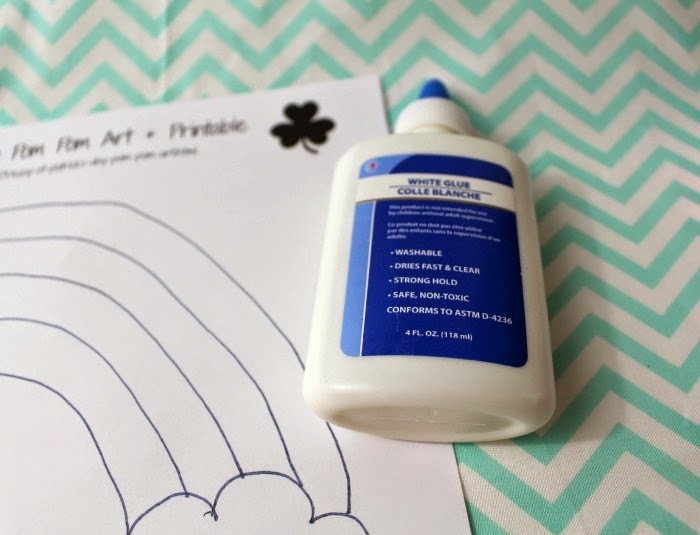 What is your favorite kids St. Patrick's Day craft? 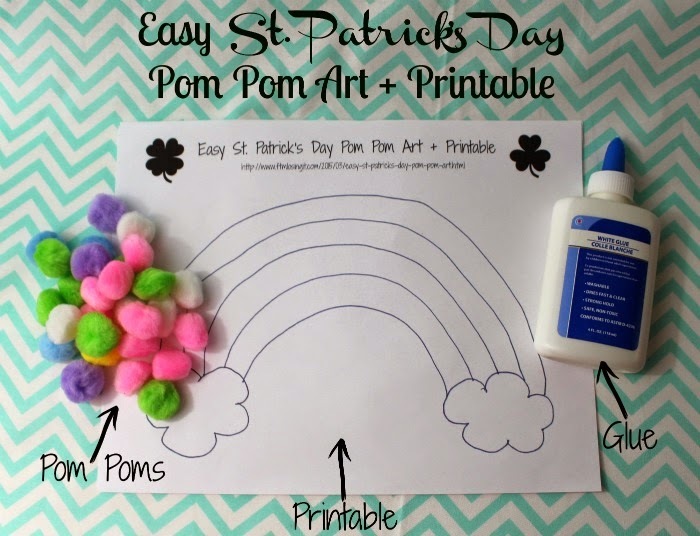 What a fun craft idea this is. My kids would love this. So fun! And I love the idea to put some glue in a dish for them to dip. I'll be using that idea soon! What a fun project for the kids!! I think we'll do this since I let the day slip right up on me. So much for my good intentions to go all out this year (it's too late to go all out decorating for me now, lol). Cute project! My six year old loves stuff like this! This is so cute, and I love that kids have creative freedom with it. It's really a good idea! Those are really cute and a great way to teach children to use glue by themselves. We all know how they love to do things all by themselves. This is adorable! My 4 year old would have a ball doing this! Super cute and love how you eased your little one into the project by putting the glue in an old juice cap. Genius! This is such a cute idea for kids. Definitely book marking this for when my younger cousins come to visit. This is such a fun activity! My daughter would love it! What a fun craft! I love it! How cute is this rainbow. My daughter is obsessed with rainbows (and unicorns) so this is right up her alley.